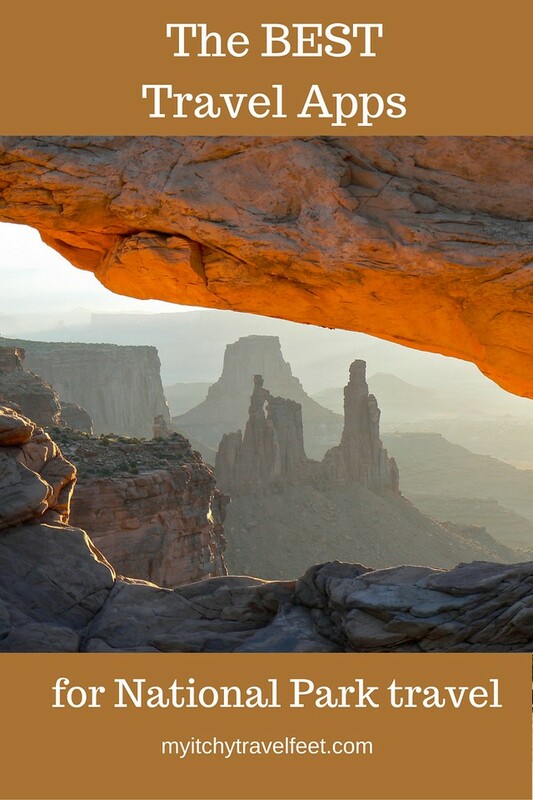 Updated 04.01.2019: Have you seen our recommendations for best national park apps? This is the most recent update that includes eliminating apps that are no longer published plus we introduce you to our latest finds. If you’re an app user who’s also a national park traveler, bookmark this page so that you don’t miss any updates. Or subscribe to the My Itchy Travel Feet Weekly Broadcast so you’ll be the first to know! In our opinion, every day is a good day to explore U.S. National Parks. From the ever-so-popular Grand Canyon—we recommend visiting the North Rim for escaping the crowds—to the more remote Denali National Park and Preserve, these magnificent and expansive parks are perfect options for active boomer travel. Whether you’re more of the glamping type or one of those “I’m roughin’ it all the way” boomers, the US National Park System has something for every style of exploration. 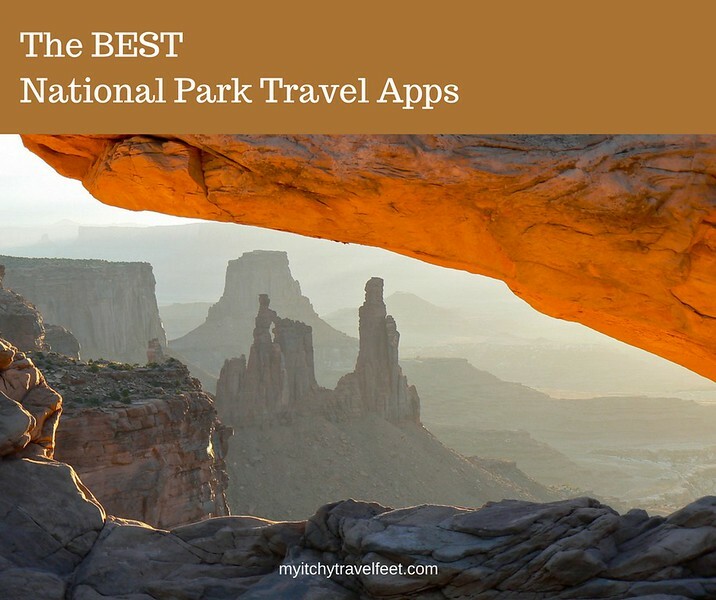 And our list of best national parks apps will help you do just that. If you’re planning a National Park trip, make sure to check out our National Park Travel Planner. No matter your travel style or National Park itinerary, staying organized and up-to-date is vital to a successful boomer travel adventure. For novices or experienced hikers, nothing compliments the magnificent natural splendor of these parks like an offline hiking app for route finding. And stargazing will take on a whole new meaning with the help of an app that identifies what you are seeing in the dark sky of a national park. So download the national park travel apps that we recommend to make your trip the best it can be. 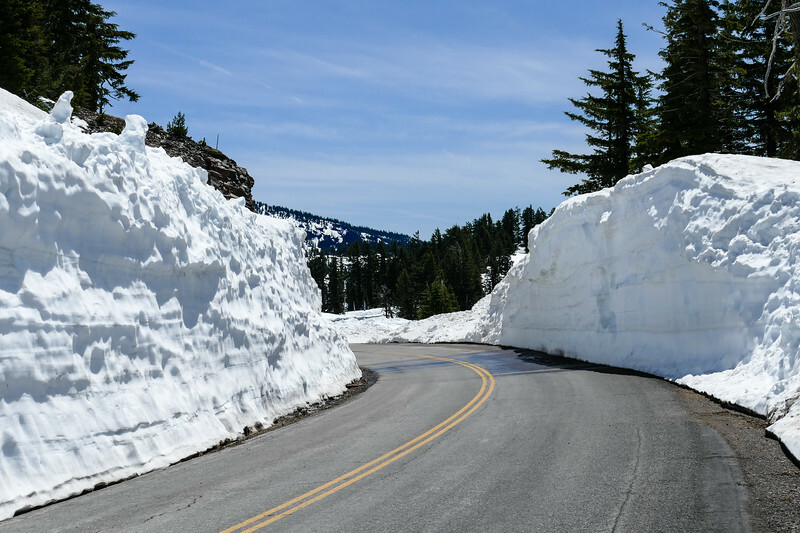 Using travel apps helped us know what to expect on a May trip to Crater Lake National Park. National Parks by Chimani provides information on 417 national park units. The free app includes historical parks, seashores, preserves and lake shores. Users can then download detailed guides, including GPS-enabled maps and also free stand alone maps for each park, which is handy when cell service is spotty. The Chimani National Parks app lets you choose your interests, then the app provides instant recommendations for each park. WIFI or cell services is required to download photos, or view the online interactive map. Available for purchase at the App Store and Google Play. ParkFinder is an amazingly in-depth app for anyone looking to do some park exploration. The app uses exclusive databases from thousands of national parks, state parks, national forests, wildlife refuges, BLM sites, US Army Corps recreation areas and many more public lands in order to provide outdoor adventurers with the latest information. Available for purchase at the App Store. Will you be road tripping to a National Park? You’ll need our list of best road trip apps. Looking for a campsite? Allstays Camping app locates available campsites not only at National Parks but also in the National Forest and other Federal Recreation Facilities. Information is instantly available for campsites, RV slips, cabins day-use and other sites. Available for purchase at the App Store. Of course you’ll need to know the weather. Weather Live provides meteorological data on precipitation, pressure, humidity, wind direction and visibility. The animated weather radar map lets you quickly see if weather is coming your way. Available for purchase at the App Store. 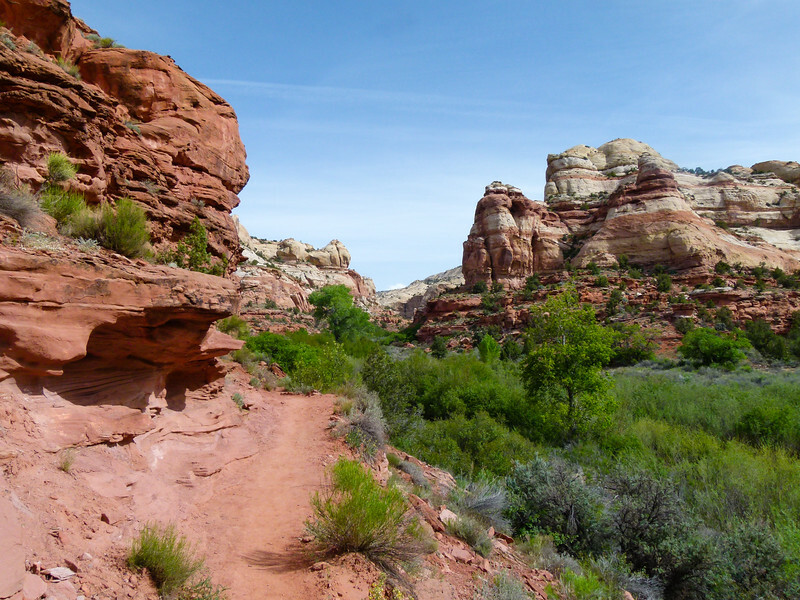 Take these hiking apps with you on a hike to Lower Calf Creek Falls in Grand Staircase-Escalante National Monument. Gaia GPS Hiking Maps, Hike App is the perfect resource for outdoor nature lovers because it offers up-to-date topographic maps, satellite imagery, and road maps of many of our national parks. Gaia GPS offers reliable GPS information that will guide you off-the-beaten-path into lesser-explored backcountry. Available for purchase at the App Store and Google Play. Map My Hike – GPS Hiking Tracker & Trail Finder offers an in-depth and interactive hiking guide. With millions of hiking trails in its database, this app is a great tool for any hiker anywhere. Map My Hike uses built-in GPS technology to enable users to track and record hikes. Additionally, the live tracking feature lets hiking companions communicate their locations on the map in real time. Available for purchase at the App Store and Google Play. REI Co-op National Parks Guide is another great hiking resource. There’s a handy “best of” search function for trails. And you won’t need a cell signal to access the data. The REI National Parks app uses the built-in GPS function of our phone for determining location, just in case you become lost. The app includes tons of other information like trail difficulty, tours, lodging and dining within the parks. Available for purchase at the App Store and Google Play. Are you looking for a National Park audio guide? Just Ahead: Audio Travel Guides automatically begins narration when you drive by colored markers on the map. Not only will you learn about geology and history but you’ll also be entranced by park stories written by award-winning writers. Works without phone service or WIFI. Available for purchase at the App Store and Google Play. Passport to Your National Parks app is a digital passport companion that references all of America’s national parks with its signature passport program, which dates back to 1986. The app lets park visitors record their visits as they participate in the stamp program. For practical use, the app lets users search parks, log personal journal entries, record personal details and share photos of the experience. Available for purchase at the App Store and Google Play. More Outdoor Apps for your National Park trip. iNaturalist is a free, interactive field guide for nature lovers visiting National Parks. This is the perfect outdoor app for anyone looking to explore not only the beauty of more than 100 parks, but also the natural wildlife in the area. Nature enthusiasts are able to spot the many birds, mammals, reptiles and amphibians in their natural habitat. The guide also helps identify native trees and wildflowers. Available for purchase at the App Store and Google Play. Star Walk 2 Night Sky Map is your guide to viewing the night sky on a National Park visit. Explore 20,000 celestial bodies as the app follows your body movements in real time. Many U.S. National Parks are known for their dark skies. Of course you’ll need a wifi or cell phone signal. Available for purchase at the App Store and Google Play. Rise – Photographer Companion – Sunrise Sunset Calendar: If you enjoy taking sunrise and sunset photos, you’ll want this app for your national park trip. Look up sunrise and sunset times anywhere in the world. And you won’t need Internet connectivity to do it! Available for purchase at the App Store. 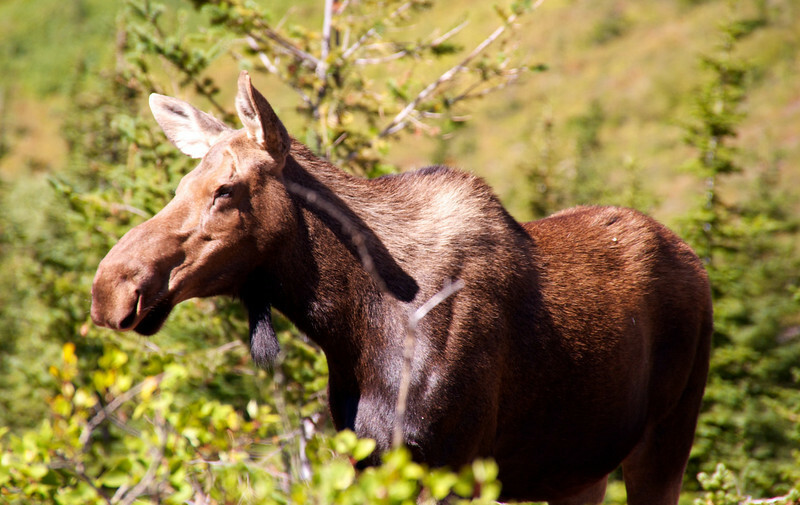 Stay safe when viewing wildlife like this moose sighting on the hike to Bullhead Lake in Glacier National Pakr. SAS Survival Guide app is for those moments that no one wants to have. Although the US National Parks Service implements a number of safety features, hiking and park exploration always carry some sort of risk. Based on the U.S. Military Survival Manual FM 21-76, this app lets user learn how to survive in the most extreme of situations, advising on ways to find water, food and shelter. Additionally, it teaches users the basics of first aid and how to signal for help, to navigate safely, to avoid unpleasant interactions with animals and plants. Available for purchase at the App Store. The Hiker Alert app is an indispensable tool for any hiker of any level. The app lets users record and share vital information with friends and family as you explore the trails. If you don’t check in on time, HikerAlert will send alert messages to your emergency contacts. Works on any mobile device. No download necessary, just register from any browser. Free. Flashlight app may sound a little too basic, but you’ll be glad to have it when you open your pack and realize you left the actual flashlight at home. Available for purchase at the App Store and Google Play. Discover more apps at our travel apps review page.